A good set of duck decoys is a must-have item for any waterfowl hunter. Yet, with the vast assortment of decoys and brands available to hunters, it can be overwhelming to know exactly where to begin. A Lab retrieves a mallard duck. Photo by Jerry Neal/CPW. If you are a duck hunter, you know the mingled joy (watching the sunrise over a river, calling in mallards to your decoys) and challenge (sitting quietly in a frosty duck blind) that comes with hunting waterfowl. In Colorado, the waterfowl hunting season is long and plentiful—which should give you plenty of time to experience both. The primary waterfowl season begins in October (check here for dates pertaining to specific areas). “With waterfowl hunting opportunities extending from mid-September teal seasons to light goose conservation seasons ending in April, there are many opportunities for hunters to enjoy opportunities to harvest ducks and geese in Colorado,” said Jim Gammonley, avian program leader at Colorado Parks and Wildlife (CPW). See our resource guide here. Although I’ve been an avid upland and big-game hunter for most of my life, over the years I’ve only dabbled in waterfowl (duck and goose) hunting. And after moving to Colorado from Minnesota seventeen years ago, waterfowl hunting fell completely by the wayside, until a friend and dedicated waterfowler, Tim Brass (State Policy Director for Backcountry Hunters & Anglers), invited me on a January 2015 goose hunt. Watching V-shaped flocks of honking Canada geese flying overhead, not to mention those enticed to within shotgun range, rekindled my desire to hunt waterfowl. For those with the same latent duck and goose hunting itch, first you’ll want to purchase the appropriate licenses and stamps. Waterfowl hunters need a small-game license, for starters. Hunters age 16 or older are also required to purchase a $25 Federal Migratory Bird Hunting and Conservation Stamp (Duck Stamp) and a $5 Colorado State Waterfowl Stamp. In addition, pick up a $10 Colorado Habitat Stamp (for anyone aged 18 to 64), but only one is required per hunter each year, in the event you bought one with your turkey, big-game or upland-game license. For most waterfowl hunters, finding a place to hunt is often more challenging than the hunt itself. These days, unless you have deep pockets for a private hunting lease or duck-club membership, the cost of entry can leave the average duck hunter out in the cold. Thankfully, Colorado offers a variety of opportunities to hunt waterfowl on public land. Excitement, adventure, beautiful scenery—that’s what hunting in Colorado is truly about. And there’s no better way to experience all three than waterfowl hunting. A black Lab and mallard ducks. Photo by Jerry Neal/CPW. For Colorado waterfowl hunters, 2017 could be an excellent year. Thanks to several years of wet weather and good nesting conditions across the Continental United States and Canada, nationwide duck populations remain above average. With excellent numbers of ducks likely to pass through the state this winter, there has never been a better time to dust off the decoys, grab the Labrador and high-tail-it to your favorite warm-water slough, river, lake or reservoir. Cathy Brons and Aaliyah. Photo by © Jerry Neal/CPW. A southerner by birth, I moved to Colorado last year with the mindset that I would be open to new opportunities. The moment arose last fall when a friend of mine asked if I would be interested in joining her on a duck hunt. I had met Randi through work, and was thrilled to make a connection with another female who shared similar passions for the outdoors and wildlife. I hastily agreed, eager to understand her enthusiasm for hunting and to find out if I might enjoy the experience myself. I hadn’t given much consideration to hunting until I took wildlife management classes in college, which fostered both my appreciation for the hunter’s role in conservation and hunting as a valuable wildlife-management tool. Yet the physical, emotional and spiritual wholeness I experienced as a novice in the field was unforeseen; something that could not have been revealed to me from the pages in a book or a lecture in a classroom. Canada geese in flight. Photo by © Wayne D. Lewis. There is nothing quite so vivid in my memories from decades of hunting and other outdoor experiences as watching V-shaped flocks of honking Canada geese flying high overhead during their annual migrations. From the lakes and rivers of northern Minnesota, where I first hunted geese, to the Eastern Plains of Colorado, where I was hunting on a recent January morning, there are few experiences that equal the sights and sounds of geese in conjuring up our primal ties to the changing seasons and hunting. Before sunrise on Jan. 31, six of us were in an eastern Colorado farmer’s field anticipating flocks of geese spotting our decoy spread from above, then circling, turning, setting their wings and beginning to glide. The perfect shot opportunity is when they ultimately commit to landing—feet out in front, leaning back nearly upright, neck and head stretched forward at an angle like a Concorde jet—it’s a sight to behold. “All good things must come to an end.” This saying rings true for many of life’s endeavors. But as the 2014-15 duck season came to a close on Sunday, these words were especially appropriate for Colorado waterfowl hunters—many of whom enjoyed a banner hunting season. By most accounts, Colorado duck hunters fared exceptionally well this year. Thanks to record duck populations and some cooperation from Mother Nature, hunters who spent the last several weeks hunkered in frosty blinds were rewarded for their dedication. Although temperatures were unseasonably warm at times (typical of Colorado winters these days), there was enough “fowl” weather during the duck seasons to keep birds on the move and smiles on the faces of most hunters. 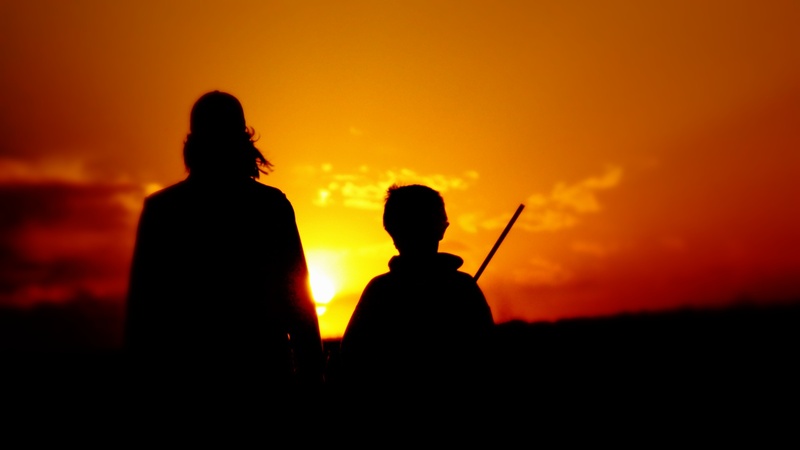 Hunter education instructor Ginger Bailey and a youth share time afield in eastern Colorado. Video capture by © Jerry Neal/CPW. For most of us, the New Year is a time of reflection. Specifically, it’s a chance to look back at the previous 12 months and identify the things we would like to change in our lives. But more importantly, changing calendars also provides a convenient benchmark that allows us to start anew and to begin looking forward. The proverbial blank canvas that emerges as one year ends and a new one begins is a prime opportunity to recreate ourselves and focus on what we deem most important. Often, in our quest for self improvement, we tend to come up with the same, almost cliché, New Year’s resolutions year after year. We strive to lose weight (again), quit smoking (again), exercise more and eat less. And don’t get me wrong, these are all worthwhile and admirable goals (I certainly could afford to shed a few pounds myself after the holiday season). When hunting waterfowl, a blind is essential to stay hidden from the sharp, well-trained eyes of ducks and geese. Although permanent blinds and pit-blinds typically offer the best cover and concealment, they are usually not an option when hunting public land. In this Colorado Outdoors “Quick Tip” video, you will learn how to build a simple but effective duck blind that works well for most applications. Best of all, this portable, light-weight blind costs less than $40.